The use of language is fundamental to the study of security as discourse, as securitised discourses hinge on the construction of threat and insecurity. Therefore, methodological concerns with the study of language have been a common theme in the interdisciplinary field of (critical) security research. A central reference has been Michel Foucault’s contributions on two interrelated aspects. First, Foucault provided the groundwork for the theorisation of discourse (Foucault 2002), and second, he also worked on genealogies of security (Foucault 2007). A wide range of disciplines have adapted and further developed Foucault’s work on discourse, such as the sociology of knowledge (Keller 2011) and historical discourse analysis (Sarasin 2006; Landwehr 2008). Other post-structural accounts of security research have emphasised the significance of power and knowledge in security discourses (Dalby 1988) and have also investigated how the Self and the (threatening) Other are constructed through security (Dillon 1990). The Copenhagen School also emphasised the construction of threats through the use of language and how certain actors are thereby authorised to speak in the name of security, and how specific actors have the power to define security. The Copenhagen School’s focus on ‘speech acts’ was criticised by proponents of the Paris School (Bigo 2002) who demanded a broader notion of securitisation that would include the role of routines and practices. Also, securitisation theory has been criticised for its methodological dilemma that arises if the subject of (in)security is silenced or only has limited possibilities of addressing security problems (Hansen 2000). 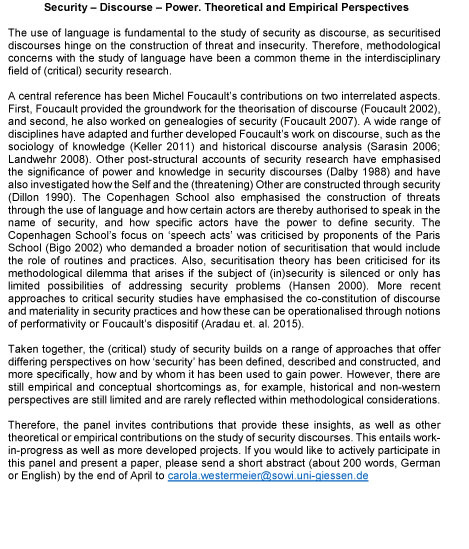 More recent approaches to critical security studies have emphasised the co-constitution of discourse and materiality in security practices and how these can be operationalised through notions of performativity or Foucault’s dispositif (Aradau et. al. 2015). Taken together, the (critical) study of security builds on a range of approaches that offer differing perspectives on how ‘security’ has been defined, described and constructed, and more specifically, how and by whom it has been used to gain power. However, there are still empirical and conceptual shortcomings as, for example, historical and non-western perspectives are still limited and are rarely reflected within methodological considerations. Submissions of contributions and panels: The languages of the conference are English and German. 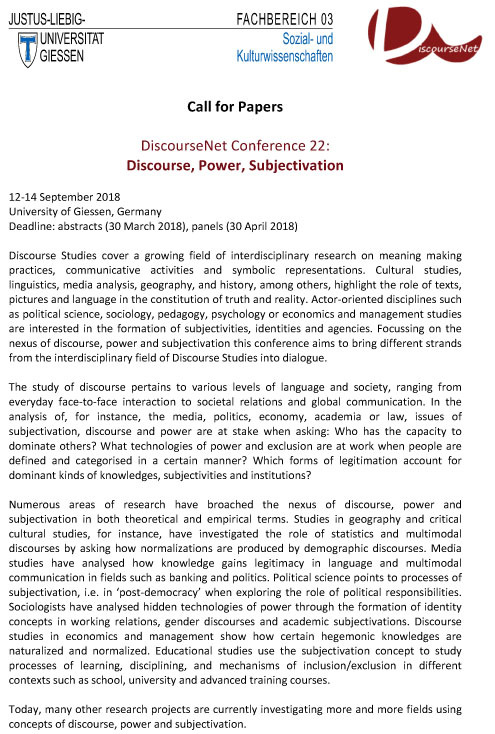 Abstracts for contributions of no more than 200 words should be submitted by March 30, 2018 through www.dn22.discourseanalysis.net. Please contact us by e-mail if this link doesn't work. If you would like to propose a panel for the conference, please submit your panel proposal that includes the names, titles and a short abstract for each presentation until April 30, 2018. Registration fees for the conference: Early-bird fee will apply until May 15, 2018 - 25 € for unfunded full time Ph.D. students and researchers without affiliation and 50 € for researchers with institutional affiliation. Late registration - 50 € for unfunded full time Ph.D. students and researchers without affiliation and 75 € researchers with institutional affiliation. We motivate all scholars from every region and affiliation to apply even in case of low or no institutional financial support. We will try (but cannot not guarantee yet) to provide (at least) gradual reimbursement of traveling costs for researcher without financial support from home university.